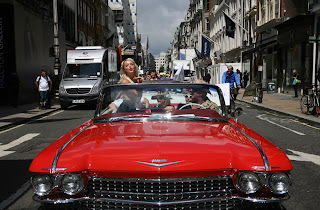 To celebrate all things French and lingerie, last week, four girls and their PRs toured London’s main shopping areas, often stopping traffic in a bright red cadillac, which was the only thing left to rival the spendy scanties worn by the vintage themed models. French brands Empreinte, Lise Charmel, Princess Tam Tam and Simone Perele were worn in a saucy 1950’s style. Crowds thronged and were thrilled by the spectacle in Grosvenor Square, Selfridges, Harrods, Harvey Nichols, Fortnum & Mason and Rigby & Peller in Conduit Street. This clever PR stunt gives a whole new meaning to Flash Mob. Did you spot the girls? Let me know in the comment box below. Next post: Comme des Garcons releases Hussein Chalayan perfume, Airborne.